Q1. How does history command work? Basic usage is simple – just execute the ‘history’ command. So you can see your previously run commands are shown in the output. Note that I have used the ‘more‘ command to make sure the output display is paused at the first page (the complete output of ‘history’ is usually very long). Q2. How to make history display date and time as well? That’s it. Now when you’ll run the ‘history’ command, you’ll see the date and time info in the output. This problem should solve itself after your complete history has been updated in a few days. You can look in ~/.bash_history to see what is the first line that has a date-time-stamp. Those are lines starting with a # followed by a (currently) 10 digit number. Q3. How to make history stop recording commands? If a situation arises wherein you do not want the system to save your commands history, then you can do this using the HISTSIZE variable. Just export it with zero as its value, and you’re good. So you can see, running the ‘history’ command now didn’t produce any results. Q4. How to make history not record a single command? Now whenever you run a command that you don’t want to be recorded in history, just execute it with a leading space. Q5. How to perform quick history search? Of course, you can use the grep command to search for specific keywords or command in the output produced by the history command. 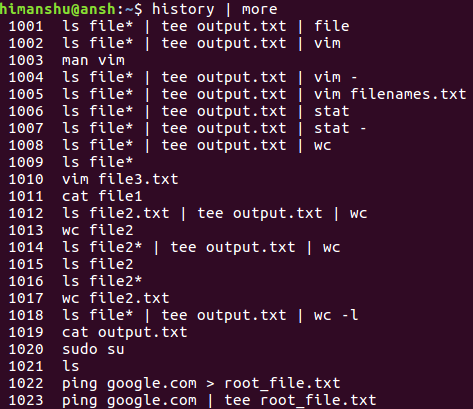 However, there also exists a much faster method: reverse-i-search. Now type the keyword you want to search, and you’ll see matching suggestions from history on the right. For example, I typed ‘man’ (without quotes), and the first result I got was ‘man apropos’. You can keep on searching this way. Once you get the result you want, just press the right arrow key and you’ll get the whole command on your prompt. So now you can run this command, or use it any way you want. Q6. How to run the previous command? Don’t believe (particularly the second way)? Try it. Q7. How to make history ignore duplicate entries in output? 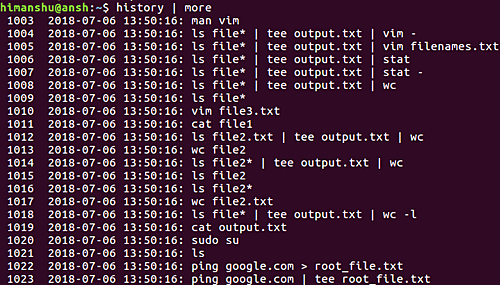 Now when you’ll run the history command, the output won’t contain duplicates. Q8. How to clear history? If you want to clear existing history so that you can start afresh, use the -c command line option. You’ll likely agree that history is a very important command that you should be aware of. In this tutorial, we discussed several important tips/trick to get the best out of this tool. Once you’ve practiced these, head to the tool’s man page for more info.